Airships drift and dart by above and below in an impossible city that is toweringly taller than it is wide. Magic prevents anyone from falling, unless you’re the one man in the world who is unaffected by magic. Steampunk gadgets, magical murder, castles of questionable location, grimy alleys with dark deals: Lunule has it all. Sign up for news on upcoming comics and conventions! Now that the dust has settled and the Kickstarter is coming to an end, we wanted to think about what's next for the Foldings. The feedback we've had from people over this first issue has been wonderful! People seem to really like it, the world, the characters, and they want to know what's happening next–so it's time to figure that out! The first piece of big news: we're using what's left of the Kickstarter money to rebuild this website. Finally FINALLY there’ll be a place where people can actually read the comics, read the stories, track the news and see all the art, all in one place! Currently we post a few pics on instagram, everyone asks what this is and I make vague excited noises and hand gestures. Hopefully with a new hub we can bring together all the people who are separately, abstractly interested in what this could potentially be /some day/ and start actually making it into an actual thing that updates regularly. Issue #1 Print, Fulfilment, Release! We've done it! The full book is at the printers, topping out in the end at 48 pages - 14 pages longer than originally intended. backer rewards are being parcelled up, ready to ship out as soon as the books arrive, and we'll be including some extra little thank you's. We'll also be opening an online store with physical and digital versions, along with any extra leftover kickstarter rewards, once everything else is sorted. 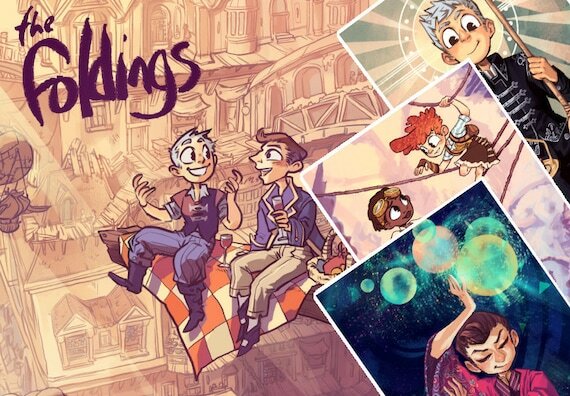 Until then we'll keep posting art, stories, doodles and wips on tumblr, so stay tuned! If you have any cons you'd like us to be at, drop us (or the con hosts) a line! Issue #1 - Fully Funded! Keep up with production on Kickstarter or Tumblr! Preorders available online from Etsy and soon from Amazon. 10 Years Earlier - Prequel Novelette. Marm has been writing a wonderful prequel "10 years earlier" so for some fantastic backstory and adorable first meetings you can check out this serialised novellette for free over on Ao3! Meet Micah and Jasper in the early days, awkward and barely out of short trousers before life smacks them upside the head and sends them down a path very different from anything they imagined. They’ll fumble their way to friendship even if events conspire to start them off on the worst possible foot. I wanted to discover the world and set us up for what will be coming—political intrigue, mystery, love, death—and see where our favorite people came from, and how they become what they are. Micah and Jasper in the beginning are mere youths who’ve never seen the kinds of magic and bravery they’ll need later on. Things are set into motion that are still driving their lives a decade after they first meet. Incurable lover of comic and conventions, has been making up stories since she discovered her brain could do that. Freelance illustrator by day, roams the streets of Lunule by night. It is her life's ambition to die on a mountain of her own finished comics. If you want to help with that dream, please check out her Patreon! Marm has been editing and writing for longer than Doodles has been alive. The monkeys have been a recent addition but seem to be effective. No monkeys will be abused in the course of creating Foldings. Like to know more? Don't hesitate to get in touch! Please park your airships in the waiting area. See more wips, sketches and stories on tumblr!